Qatar region by Tankoa Yachts. At the same time he was appointed Brand Ambassador for Baglioni Hotels and Worldwide Shows Corporation. His work is discussed in the most important Italian and foreign newspapers: “No one suits the term enfant prodige more than him” (Capital – October 2007). “Food, fashion and music are one and the same thing for Cecchi known as the ‘poster boy’ of young Italian entrepreneurs” (Il Sole 24 Ore – April 2005). 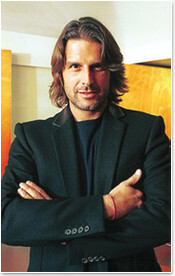 “A manager in the ascendant who mixes high fashion, art, music and high tech, he has revolutionised the city’s commercial profile.’’(Panorama – November 2003). He was listed in Sky TV’s E! News Top Ten of successful thirty-year-olds. Today he lives in Spain, France and sells ideas the world over. Stefano lent his image to the Cystic Fibrosis Research Foundation run by Matteo Marzotto for the sixth edition of the Portofino 2010 charity event as a testimonial to collect funds and assist in promoting the event. Stefano has always been focused on social issues, working alongside other business people with the elderly or supporting initiatives such as the Turin Marathon event organised for the “La Stampa Specchio dei Tempi” Foundation and supporting the elderly in conditions of hardship for the Croce Verde (Green Cross – Health Association).He has been working for the past year with the Seedling Nursery School in Tilak Nagari Jaipure India which offers assistance to abandoned children.